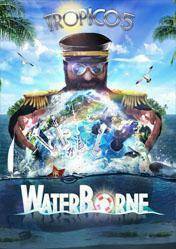 Tropico 5 Waterborne is the first expansion for the management game Tropico 5 and it comes with a lot of new gameplay features and improvements: trafficking of water, the largest coastal areas and new events to keep even the experienced rulers of the island in a constant state of alert. A new campaign encompassing 6 epic scenarios, new dialogue and a new story and events, which greatly extend the gaming experience of this fantastic game in which you take the role of a dictator of a paradise island. The Waterborne expansion includes: A new campaign and a history spanning six challenging missions, 9 new buildings, 4 new maps of our beloved island, new music and accessories for our dictator.